InGameNow has been down since Saturday... So have thousands of other sites as 9,000 servers were caught in a massive fire at server and hosting company The Planet's Houston, Texas data center. Now the good news is that no one was injured and that 6,000 of those servers were restored last night at 5:06pm CDT. The bad news: InGameNow is still down. There are numerous lessons to be learned in this ordeal (one of which is the strain this causes on a start up, it's users and the engineers), but I am particularly struck by The Planet's responses - which truthfully has been mixed. I often write about the importance of transparency. For customers, The Planet has been very transparent and responsive. They have sent out numerous mailings (see below), are reachable via phone, and in Twitter-esque style, are updating a blog / forum each hour with "Data Center Status Updates". Considering the severity of the issue, I applaud the type of regular communication and frankly, it probably also relieves some of their CS burden. That transparency, however, isn't reflected to new customers - and that's disturbing. 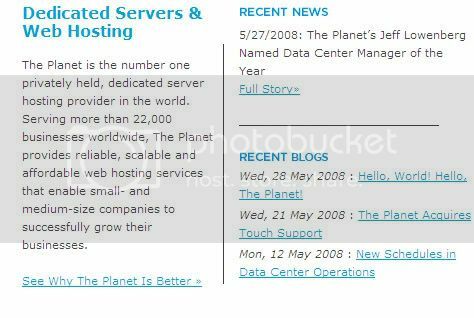 There is no mention of any issues in either "Recent News" or "Recent Blog Posts" - in fact, their main blog is linked to directly on the homepage and hasn't been updated since May 28th (last post: Hello, World). And much of the page is dedicated to "Learning more about World Class Data Centers". Considering the circumstances, perhaps part of the page should be dedicated to support or at least linking to the Status Blog. 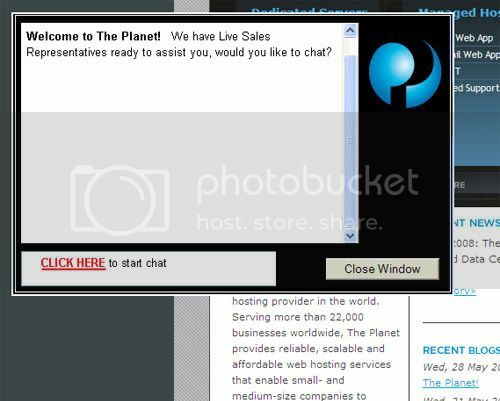 The part that really irks me is the default pop-up screen that asks you if you'd like to interact with Live Sales Representatives... I am tempted to type in "When will InGameNow.com be running?" Update: 11:05am pst InGameNow is now up... although, as you can tell, it is running slowly and graphics aren't rendering as the necessary fixes we have implemented will take a few hours to propagate.